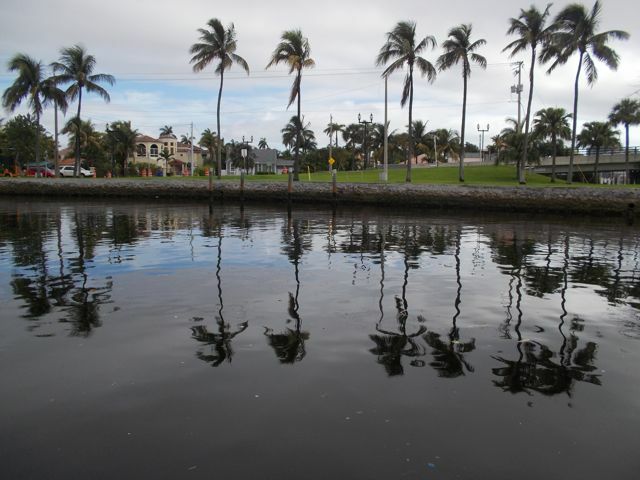 View from our 2nd mooring ball, Las Olas Marina, Ft. Lauderdale. After sailing over 1600 miles, visiting 13 countries*, over 8 months, we’re here, sort of. 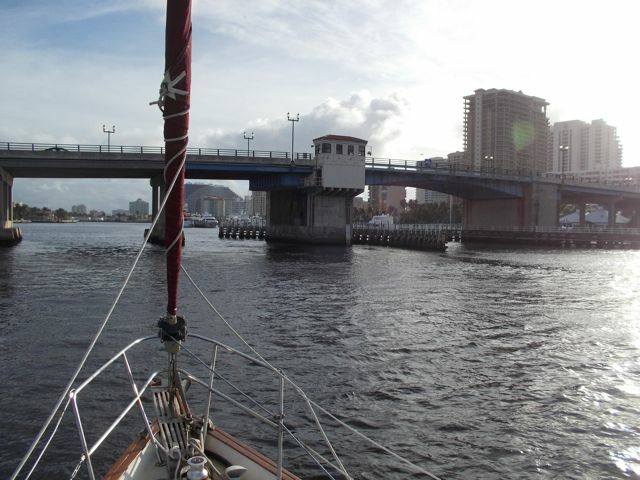 View from our 1st mooring ball, Las Olas Marina, Ft. Lauderdale. the prevailing wind for better cabin ventilation. Where exactly is here? We’re not quite sure. At the moment, it’s in Ft. Lauderdale, but that’s only because of three Ft. Lauderdale airport flights. Two flights were Wayne’s Dad and his wife Gunnel, returning to Portland Oregon after sailing with us (look for a future post on that). One was my flight, to my nephew’s wedding in Colorado. We’ve already determined Ft. Lauderdale will not be “home” for the next six months or so, whist we wait out hurricane season and replenish our cruising kitty. For non-cruisers, a “cruising kitty” is not a cute, furry meow-meow, but the cold, hard cash it takes to live off of and keep one’s boat livable while meandering the world by water. Why not Fort Lauderdale? It’s expensive and spectacularly cruiser/liveaboard unfriendly. How unfriendly? Unswimmable, Undrinkable, Nasty Water: It’s brown. Our watermaker (which desalinates and purifies our water for drinking and dishwashing) is off while we’re here; we don’t want to destroy its filter. Our toilet (or “head” in sailor-speak), which uses “raw” water (whatever is below our boat, rather than water from the boat’s water storage tanks) is stained brown from the local water. Manatees (click here if you don't know what a manatee is) might, but there’s no way I’d consider swimming in this stuff; it’s gross. Coulda taken a photo but just decided it was too gross and didn't want you to believe it was due to my housekeeping habits. One Night Stand: Discount rate for our small boat at the local marina was $100; we considered $60 expensive for us, which is why we almost always anchor. St. Lucia in the off season, was $14. Hooking it: Anchoring spots are few and far between, often limit the days you can anchor, and there’s no place to land your dinghy, as there’s…. 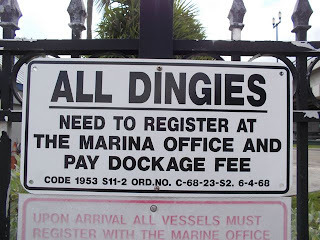 No Free Parking: Dinghies have to pay to stay, at a marina or a restaurant (minimum $10). We’re used to free. It’s tough to survive, boat-bound; if we’re anywhere but docked at a marina (anchored or on a mooring ball) we still need to get ashore via dinghy. The dinghy needs a place to “park” while we’re on land. Lingering Longer: For dinghy access and internet and place to park a rental car, we’re tied to a mooring ball at Las Olas Marina. Daily cost? $35 + tax. Mucho Money Monthly: If we worked here, monthly docking would cost us at least $1000 month, an apartment about the same, plus another $350-400 if we store our boat on land (in Florida’s Cape Canaveral area). In Everett, we paid $225 monthly for our 27’ sailboat; a 36.5 footer would be a little more. signs read "Private Property. No Dinghies." More pertinent, Fort Lauderdale and Tampa/St Pete are not where heavy maintenance aircraft mechanic jobs are popping (versus “line” jobs, where there’s a lot of down time on a shift). In any case, we’ll soon sail North up Florida’s coast, as we’ll either liveaboard and work or drydock our boat there snug and safe (we hope!) through hurricane season in a "hurricane hole." We’re expecting something on the job front to pop soon…. Once we’re settled, we’ll start planning our next cruising venture, either back into the Caribbean for another 6+ months, or down through Panama into the South Pacific and beyond. In between, lots of opportunity to catch up and improve Galley Wench Tales' blog/website.